There are many reasons for a banquet. It may be a birthday and a friends meeting, wedding and so on. One should properly prepare for it in order to hold a successful banquet. Start preparation with making a guest list. You need to do that to know exactly whether a restaurant is suitable for your guests. This will also help in determining the type of event and taking into account the tastes of each guest. Once the list is ready, it is necessary to decide on a budget. Its minimal size is easy to figure out by calling several restaurants and asking about the value of the lease for the evening. You should also set the maximum size of the budget, as unforeseen situations can always happen and that may require certain costs. To dispose the means properly, take the greatest amount that you can afford to spend on a banquet, and subtract about a twenty percent from it. Set these funds aside just to be safe. Divide the remaining money by the number of invitees. Thus, you can know exact budget per person. Then you can start phoning banquet halls, restaurants, cafes and other places, to negotiate the lease of the hall. After you find the appropriate options depending on the budget, it is necessary to visit the place to see the interior and to clarify the menu as well. Typically, each restaurant has a menu template for a banquet. It can be left unchanged, or some adjustments can be made, and you can offer your own if you wish. When planning a banquet, you should take into account every detail, especially how the quests will get to the restaurant and then how they return home. It is better to ask each guest, whether it would be convenient for them to get to the destination. Banquet hall is a room or building that is used for banquets, parties, birthday parties, receptions, wedding receptions, corporate events, buffets, banquet-cocktails, banquet-teas, swedish-style buffets, coffee breaks, and many other ceremonial and official events. Banquet halls are usually located in restaurants, cafes, clubs, pubs, hotels, etc. Organization and banquet service is an important direction in the restaurant and hotel business. Banquets work on the image of the institution. It is a good way of attracting the visitors that also helps to extract more revenue. To get gather a large amount of people for many different occasions, a banquet room is a perfect place. For business meetings tables and multi-media equipment will be required. A wedding party needs a festive room for dancing and catering. In case of lecture event, you will need a plan for a platform, stage and chairs organized in rows. To accommodate the variety of use cases, a banquet room floor plan needs to be flexible and yet able to comfort all the different purposes of the room. Banquet hall must be comfortable, cozy, with impeccable service. It's very important that it was elegant with correctly selected furniture and holiday accessories. Tables and chairs must be conveniently placed. The layout of tables depends on the clients desires, type of banquet, number of guests. with our Banquet Hall Plans Software. ConceptDraw DIAGRAM provides Cafe and Restaurant Plans solution from the Building Plans Area of ConceptDraw Solution Park. 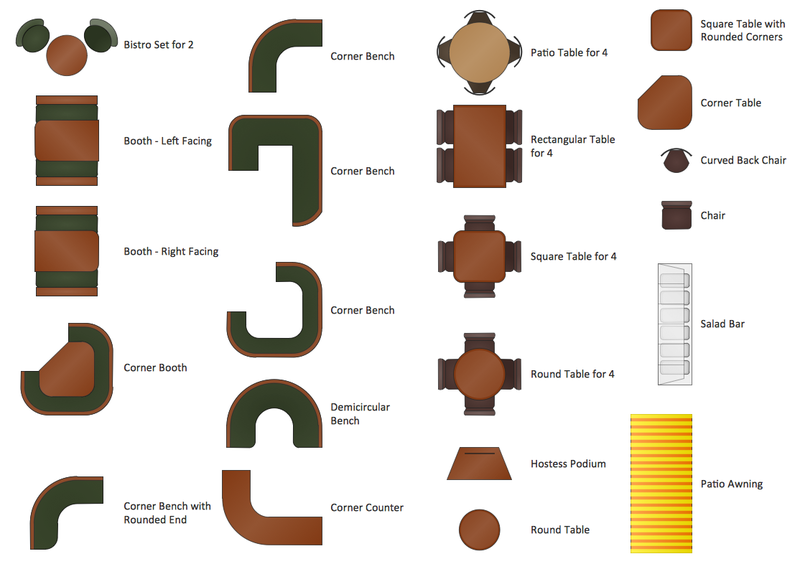 Cafe and Restaurant Plans solution contains a great number of ready-to-use vector objects of tables, chairs, benches, etc. 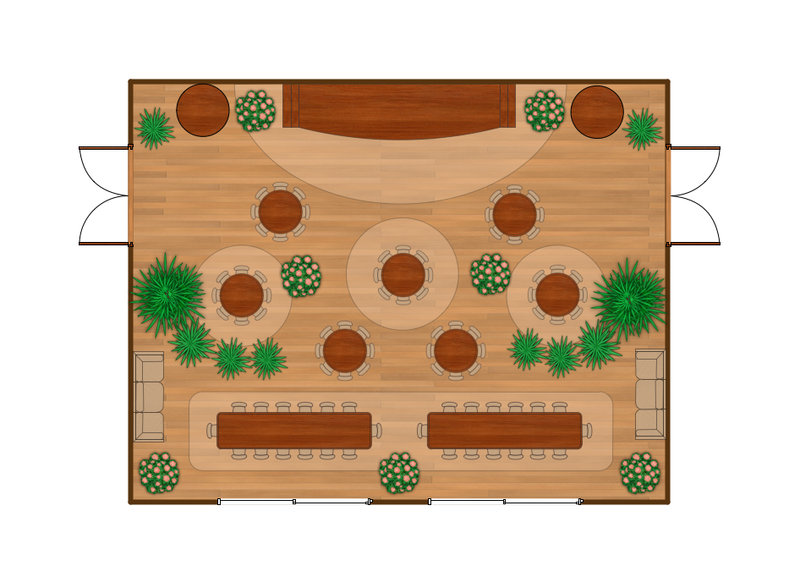 that allows you to design the Banquet Hall Plans with anyone arrangement of tables. Cafe and Restaurant Plans solution also provides many samples and templates for quick, easy and effective designing Banquet Hall Plans. This sample was created in ConceptDraw DIAGRAM using the Cafe and Restaurant Plans solution from the Building Plans Area of ConceptDraw Solution Park. It shows the furniture layout in the Banquet Hall. The Building Plans produced with ConceptDraw DIAGRAM are vector graphic documents and are available for reviewing, modifying, converting to a variety of formats (image, HTML, PDF file, MS PowerPoint Presentation, Adobe Flash or MS Visio), printing and send via e-mail in one moment. A cozy atmosphere is crucial for the success of any cafe or restaurant. To provide it, you should use restaurant floor plan software at the stage of design. If your establishment is located conveniently and has a harmonic atmosphere inside it, this is bound to be a success. 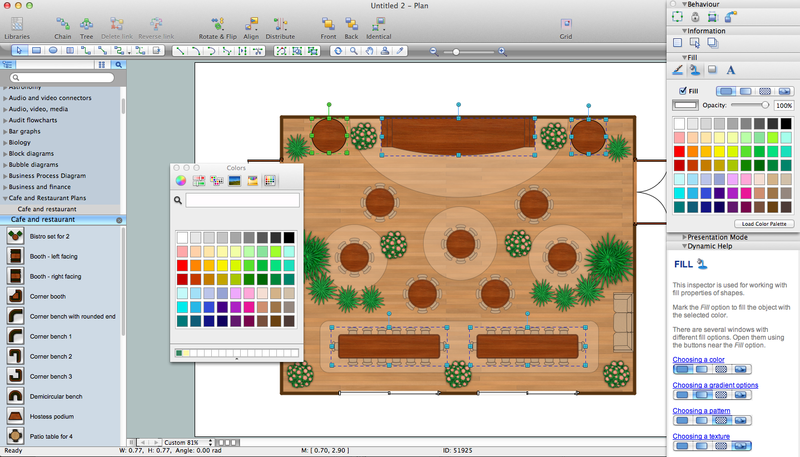 This sample Restaurant floor plan illustrates the possibilities of ConceptDraw solution for Cafe and Restaurant plans. It represents the location of the restaurant's main hall with its furnishing as well as a plan of kitchen and toilets. Generally, Cafe and Restaurant Plans solution has a big set vector images of tables, seats, lightening, etc. Using them you will be able to plan the restaurant of your desire with an incredible design and spirit. Quick and building plan software for creating great-looking office layout, facility plans, building plans, store layouts, home floor, electrical plan and commercial floor plans.